It’s simple. We control every step to ensure the highest quality. Step 1 is Breeding. All our cattle are bred to Roseda bulls, or to bulls carefully selected from other farms, with the genetic traits that produce outstanding beef. Step 2 is Natural Feeding. 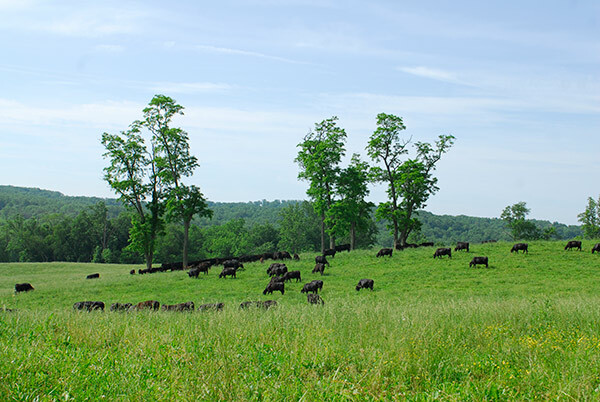 Calves are weaned at about seven months, and graze in lush green pastures for most of their lives. Then they are placed on a wholesome diet of chopped corn plants and kernels, corn, hay, alfalfa,soybean meal, vitamins, minerals and fresh water. We use no hormones or chemical additives, and no antibiotics unless medically necessary. Step 3 is Dry Aging. We work with two local packers who dry age all of our beef for 14 to 21 days for outstanding flavor. In fact, each animal has its own “biography.” We can tell you its pedigree. We can tell you if it was raised at Roseda, or to Roseda standards at one of our affiliated farms. We can tell you how it was fed and when it was harvested. We can trace specific cuts of meat back to specific animals. More than 50% of Roseda cattle qualify as Kosher. That’s about twice the rate of ordinary herds – and one more result of Roseda’s stringent quality control every step of the way.